If you want to setup your futuristic Bubble Chair without attaching a chain to your ceiling, you are going to choose a C-shaped stand made of stainless steel, which provides the modern industrial feel. 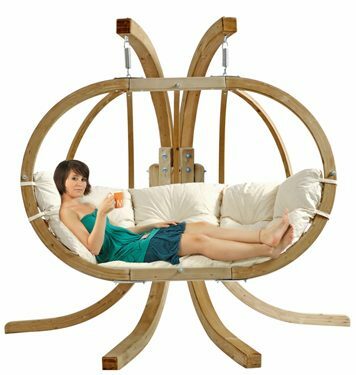 But if you need a stand for a hammock chair or a wooden hanging chair, hanging chair frames made of natural wood are the first choice. Their beautiful natural design can add warmth to your living room or make you feel at home in your garden. 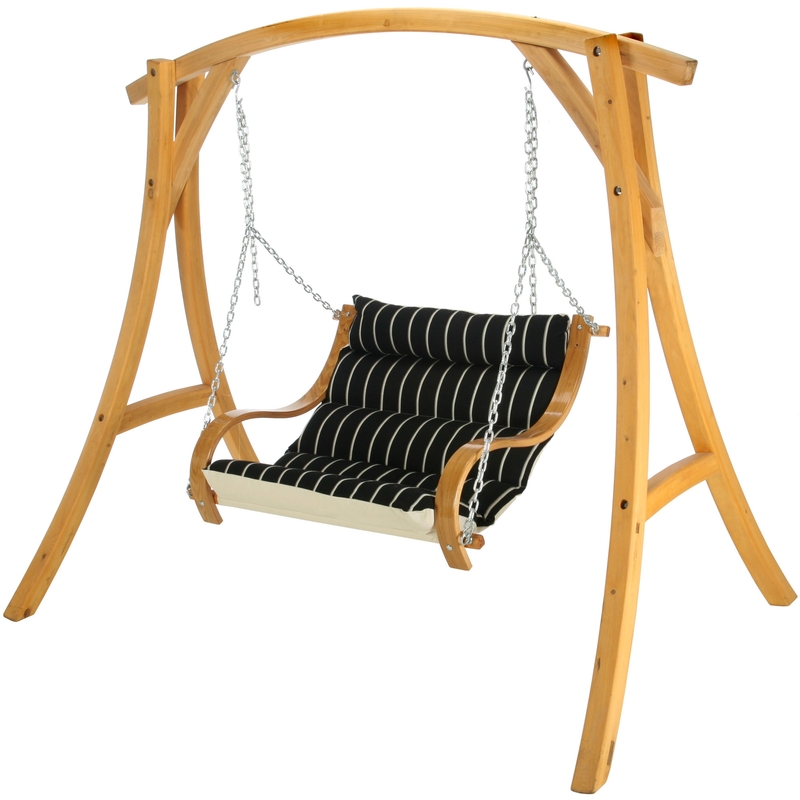 Let’s take a look at the best wooden and metal hammock chair stands available. Here you can a few tips what do you need to consider before making a purchase. Wooden hanging chair stands are usually made of weatherproofed spruce wood and are extremely durable, weather-resistant and look simply great against all the greenery in a garden, but also a large living room will definitely feel much cozier and more inviting with a wooden hanging chair stand. 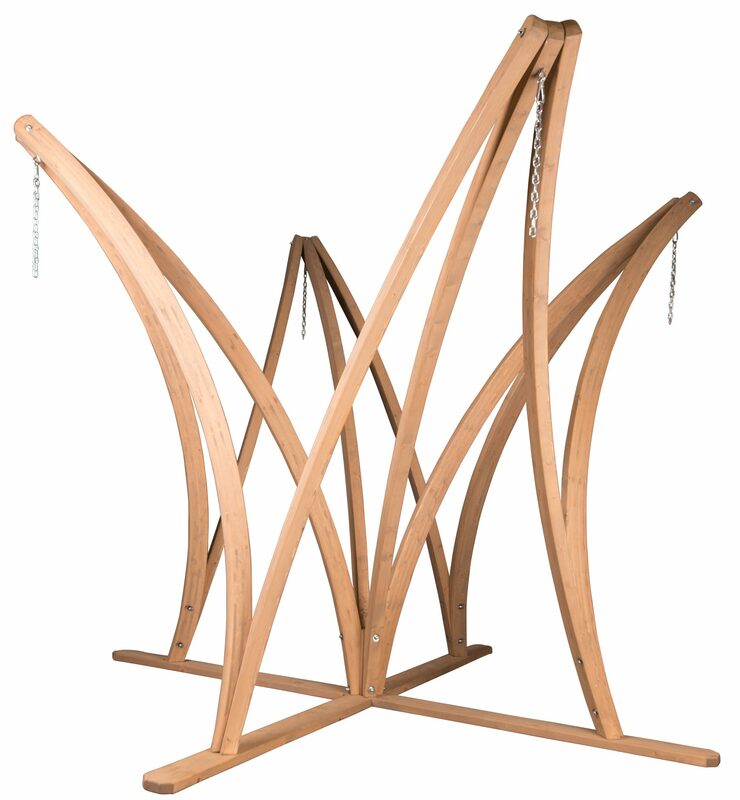 The beautiful hanging timber hanging chairs stands by Jangram Styles are new on the market. The Exaco Trading Company brought them 2019 in the USA shops. The frames are designed and produced by Jangram Styles, the company which is well known in Europe by using only established high quality and 100% FSC Scandinavian timber. The Atlas Hanging Chair Stand by Bayer of Maine is a very durable and quite high hanging chair frame made of weather-resistant spruce. It has a weight capacity up to 350 lbs which is an extraordinarily good value. 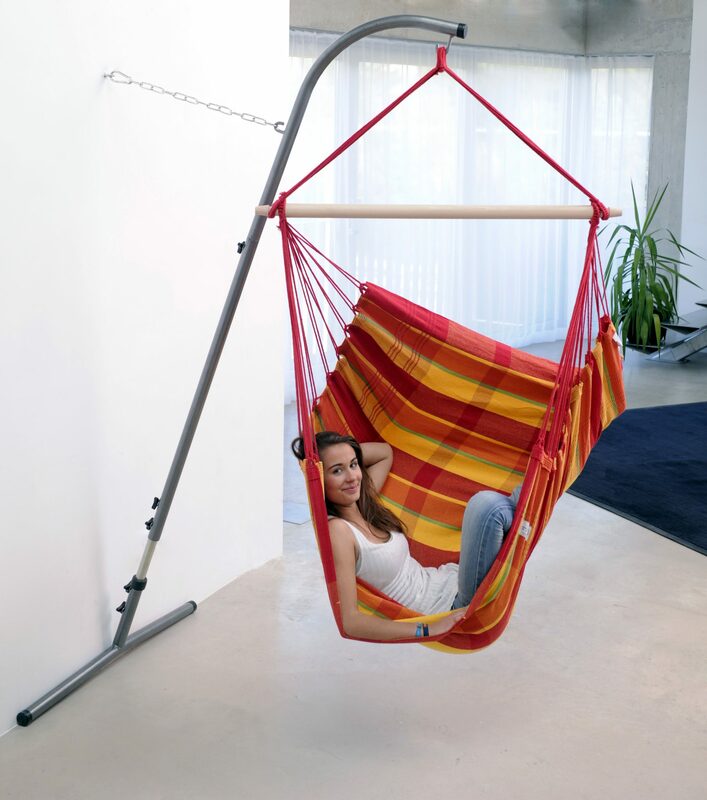 This makes the frame suitable for really large hanging chairs for more than one person such as the Hammock Chair Lounger HABANA. The stand is suitable for hammock chairs with spreader bar (pivot style) or any other swing chairs which require only one anchor point. Hanging range from 79″ to 95″. It is handmade in Poland from laminated spruce wood that is specially treated for weather resistance. All metal hardware has been galvanized which ensures a long-lasting durability. The stand is adjustable as well as sturdy and durable. 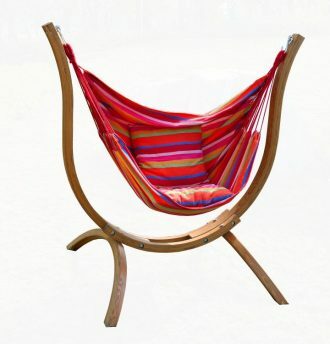 It is suitable for all hammock chairs and many swing chairs. It comes complete with hardware and is easy to assemble. 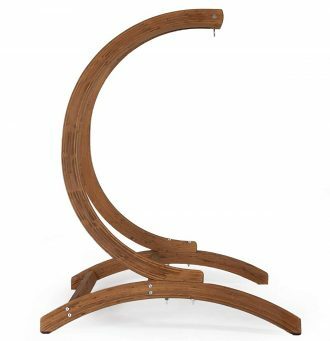 With a price of about $400 & free shipping, it is a rather favorable wooden chair stand. Made of compressed larch wood and stainless steel parts, this stand is suitable for outdoor use and is an excellent addition to any backyard, but thanks to its beautiful design is also suitable for indoor use. Perfect in combination with a hammock chair without the spreader bar. Unlike the previous one, you can use this stand for a hammock chair without a spreader bar, cause it supports to anchor points. A luxurious and unique wood hanging chair stand was designed exclusively for the Globo Hanging Chair by Bayer of Maine (read our review). It was made fully by hand from weatherproofed spruce and all metal parts have been covered to be corrosion resistant, so you can place it indoors and outdoors. 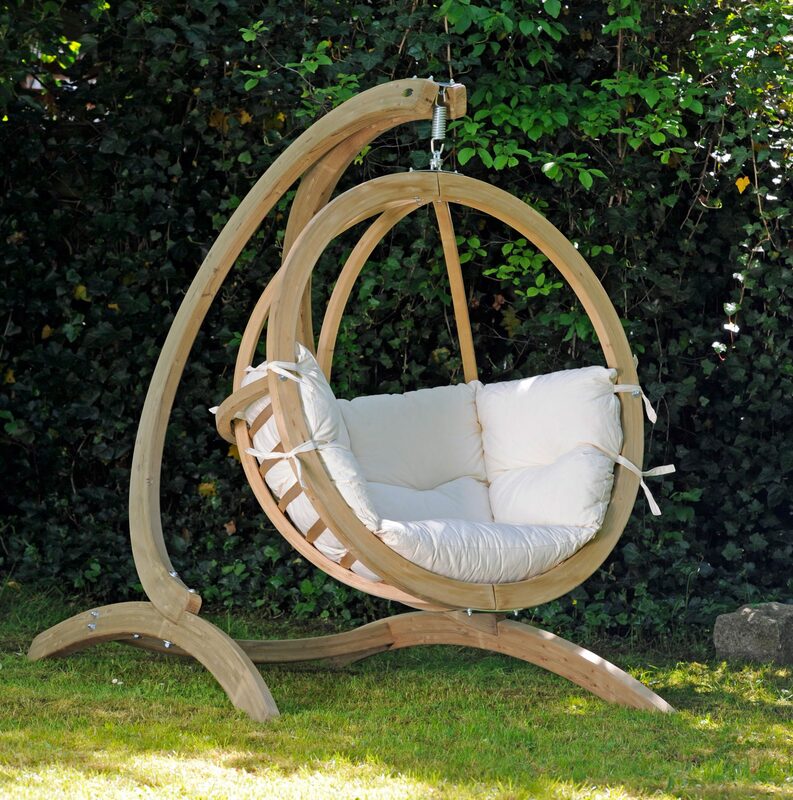 The combination of award-winning design and superior quality make this beautiful hanging chair a masterful addition to your home or garden. This stand is beautiful from all sides and is unavoidable to be the center of every space you place it. This stand is similar to the previous one. The manufacturer and the quality are of the same caliber, only this one has two anchor points is larger and suitable for the beautiful hanging swing ‘Globo Double” which is pretty much identical to the Hanging Globo Chair, except twice as big. This stand manufactured by South Mission is suitable for single or comfy hammock chair loungers but also for all kind of swings. It is made of 100% real cypress wood, which has natural patterns and imperfections, and color may vary insignificantly. Dimensions: 78″(W) x 60″(D) x 82″(H). With this product, you can get a really elegant wood swing stand for a low price. Hatteras Hammocks is well-known for its quality products made in the USA. Their hammock chairs stands have much stronger construction and better performance than some other wood structures out in the market. 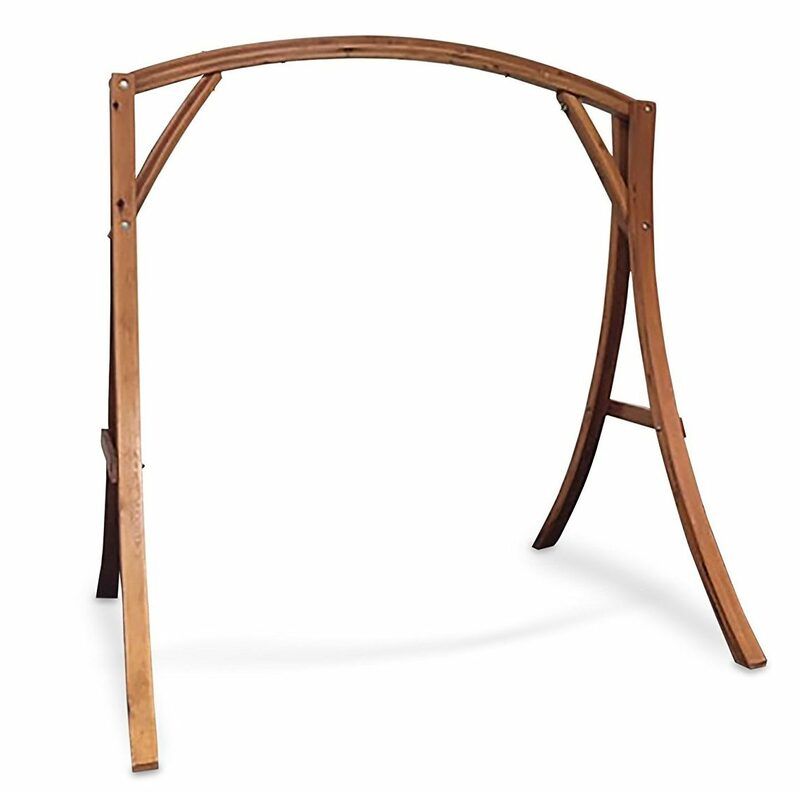 This Cypress Swing Stand Roman Arc ® by Hatteras Hammocks has won the international “Design Excellence Award” in 1990 and according to the information of the manufacturer is most widely copied hammock stand around. It is large and strong enough to fit a double size swing chair. The instructions were well written and all the required assembly hardware was included in the shipment. The material is of good quality cypress made in the USA. The hardware is zinc-plated. Dimensions: 7 ft. x 5 ft. 6 in. x 7 ft. This grand, awesome and impressive hanging chairs stand by la Siesta named CAROUSEL supports four hammock chairs at once. 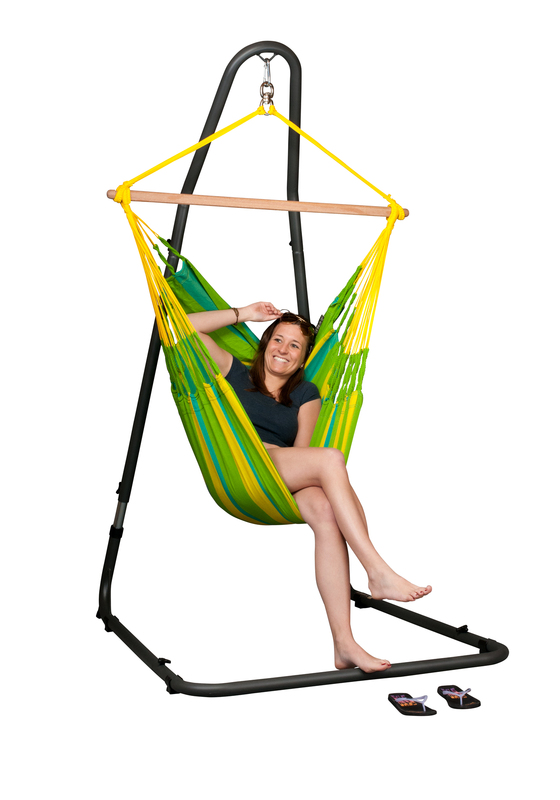 It was designed for the deluxe-size hammock chairs but it is suitable for all hammock chairs and many swing chairs. It is made from especially sturdy wood, making it ideal for larger outdoor living and entertaining spaces. What is better than hanging out in a hammock chair? Hanging out in hammock chairs with friends. The ceiling suspensions are usually complicated and wooden frames often take up much space. Steel Hanging Chair Stands are very simple to install, space-saving and usually, have a simple form. Therefore they are the perfect choice for a balcony or a small terrace but of course, they also can be used in the gardener inside the house. Almost every hanging chair stand is suitable for both indoor and outdoor use. If yours it is going to be kept outdoors, a stainless steel stand might be worth investing in, as it will resist rust and weather-wear very successfully. But the wooden stands are also outdoor resistant. 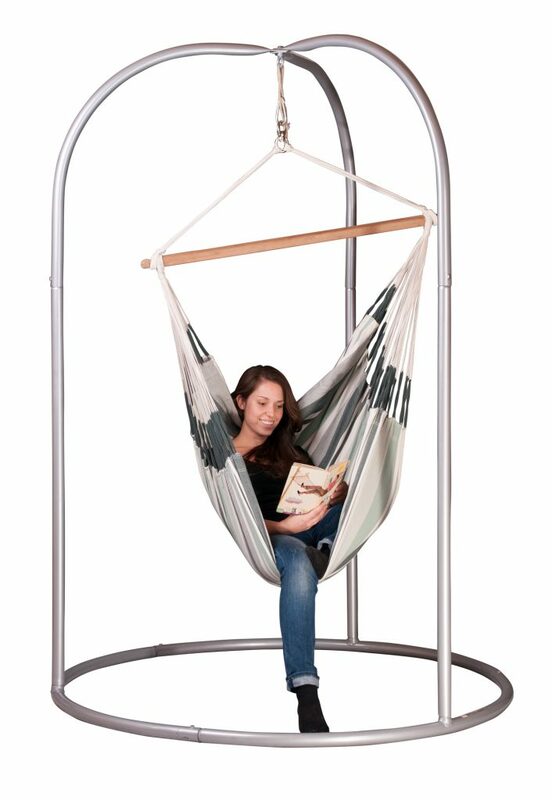 The tripod cacoon and hanging chair stand can be the centerpiece of your backyard or pool area, but you can use it indoors too.The stand can be used even for hanging bed. This simple but high-quality, space-saving and height-adjustable hammock chair stand made of powder-coated steel is suitable for different sizes of hammock chairs. Easy to use, easy to assemble and easy to clean. 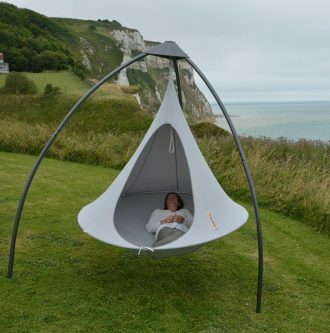 Romano Silver – Powder Coated Steel Stand for Basic or Lounger Hammock Chairs by La SiestaDurable and easy to clean. 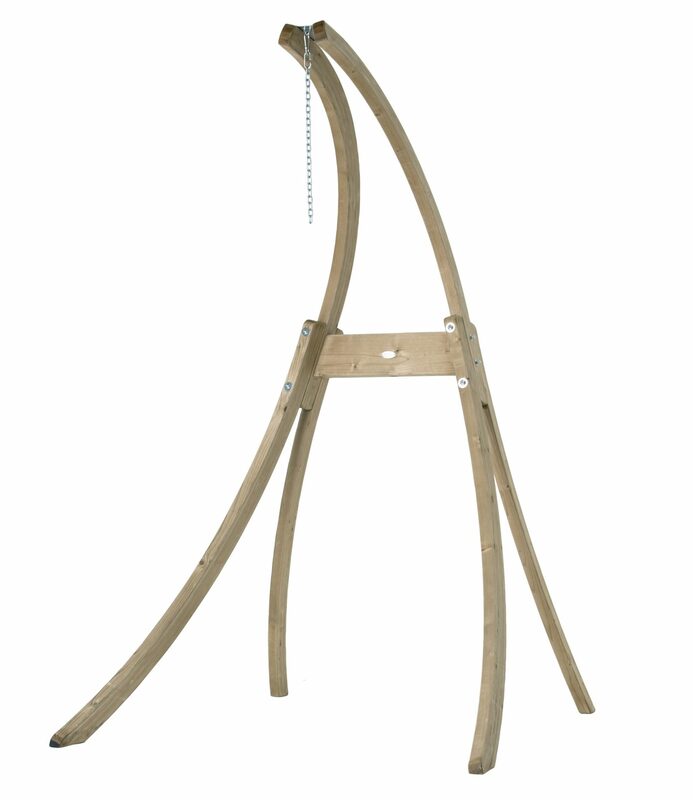 This unique Hammock Chair Stand by Byer of Maine is the cheapest of this brand, is adjustable in height and needs a wall for fixing. The purchase of the frame is worthwhile if you don’t want to have a clunky frame, but the ceiling of your room simply is not suitable for a classic suspension. The base of the stand fits against the wall and the top is fixed to the wall with the supplied bolt. When not in use, this durable, space saver stand can be is stowed away flat against the wall when it is not.